I’m inspired to see that so many have already pre-registered, proving that the interest for this conference about consequences and applications of carbon-free, abundant, cheap, compact and clean energy sources in general, and LENR in particular, is significant. On the symposium’s website, you will now also find the preliminary program for the June 18-19 session, as well as the abstracts for the speakers’ presentations. Today, I’m also proud to announce another speaker at the symposium—former Royal Dutch Shell executive Joris van der Schot, who will address the urgent need for alternatives to oil and other fossil fuels due to climate change, and also put LENR into perspective with regard to existing renewable energy technologies such as solar and wind. I’m still planning to add a few speakers to the program and specifically, I’m working on introducing at least one female speaker, which would be greatly needed! 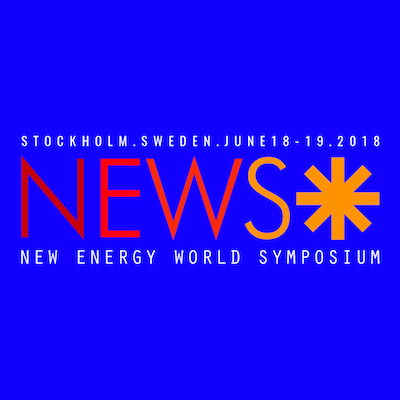 For those wondering about the E-Cat inventor Andrea Rossi’s potential role at the New Energy World Symposium, I would like to clarify that the Symposium has no connection with Mr. Rossi or with his company Leonardo Corporation and that he will not be part of the program. Now, I’m very much looking forward to continuing the planning for an inspiring and rewarding conference, providing the best possible environment for people who want to stay at the cutting edge of disruptive energy technologies to meet and network with each other. The current development in LENR, where things seem to be moving fast towards confirmation of a new energy source, could finally open a way to dispel what I call the streetlight paradox of energy. This is pretty much how we’re searching for ways to produce energy, looking in a narrow field of scarce energy sources, when there’s an incredible abundance of energy everywhere around us, stored in matter. It’s just a question of extracting it, but essentially we haven’t even started to try yet. The first is by burning fuels like wood, peat, energy crops, oil, coal and gas. These sources are basically on-demand — energy available when you need it — and quite transportable, but apart from wood, peat and energy crops they’re not CO2 neutral. The second is energy harvested at the moment from natural sources, such as wind, hydro, wave and solar energy. They are CO2 neutral, but not on-demand (except for hydro power at a certain extent). The third is power from nuclear power plants — a nuclear process known as fission. It’s on-demand, CO2 neutral, but not very transportable. Let me first note that the first two categories (i.e. everything except nuclear) are all derived from solar energy. Wind and water movements are caused by the sun, and all fuels in the first group originally derive from plants which grow by solar energy. Since we want a CO2 neutral energy source, and since nuclear power is associated with significant safety risks, people mostly investigate energy crops from the first group, and everything in the second group. And in order to make energy from the second group on-demand, we store it in batteries or as hydrogen gas or other producible fuels. Influenced by the ease of use of oil and gasoline, we end up with similar solutions — fuels or batteries that are on-demand and often transportable. They all rely on chemical reactions to produce energy, like most natural energy producing processes on Earth, including fire and the energy consumed by all living animals. This is what I mean by the reference to the streetlight joke. Chemical reactions are abundant on Earth, but they have no importance as energy sources in Universe where nuclear reactions dominate completely. All the stars, including the sun, get their energy from nuclear reactions, and consequently energy from category one and two above is originally derived from a nuclear source. Chemical reactions involve electrons — the tiny particles that surround the nucleus in the atom — whereas nuclear reactions involve the much heavier particles in the nucleus itself. And the crucial difference is that nuclear reactions release about a million times more energy compared to electrons, from the same amount of fuel. In other words, one gram of nuclear fuel will yield the same amount of energy as about a ton of chemical fuel such as gasoline or wood, or the energy stored in a ton of batteries. Nuclear power sources are hugely more compact. And here comes the hook. In the end, all energy comes from matter, which was described by Einstein in his well known formula E=mc^2 — energy equals mass times the speed of light squared. And since the speed of light is so high, this means that there’s an enormous amount of energy stored in matter. To be precise, one gram of matter, if transformed into energy, will yield about 25 gigawatt-hours, roughly corresponding to one day’s production from a nuclear power plant or to the energy from burning 568,000 US gallons of automotive gasoline. And in fact, in any energy releasing reaction, be it chemical or nuclear, the energy corresponds to a slight decrease in mass of the ‘ashes’ compared to the fuel. In chemical reactions this decrease is so small that it’s hardly measurable. In nuclear reactions it’s a million times bigger, which means that nuclear reactions are a million times more efficient in turning mass into energy. Yet they’re not very efficient. As an example, the first atomic bomb contained about six kilos of plutonium, but only about one gram of this mass was turned into energy at the detonation, corresponding to the amount of energy mentioned before. By now I believe you might see where I’m heading. There’s no lack of energy. The energy stored in matter all around us is simply immense. The challenge is to harvest this energy at will in controlled situations. Chemical reactions, including batteries, have lousy performance. Yet, this is where we’re focusing our research, like the drunkard under the streetlight. Two single nuclear reactions are also found under the streetlight — fission (in nuclear power plants) and hot fusion which occurs in the sun and the stars, and in which researchers have poured billions of dollars for decades to turn it into a controlled energy source, without much success. The problem with both these nuclear reactions is that they produce lots of deadly radiation and radioactive waste, and require big structures to be run safely. Yet nuclear reactions are desirable. They’re much more efficient than chemical reactions, they’re on-demand and they’re CO2 neutral. And guess what — just outside the light from the lamppost emerges another nuclear reaction — LENR — which few people believe is possible, simply because it’s not under the lamppost. Yet LENR promises what we need — an energy source that is cheap, can deliver on-demand and emits zero carbon dioxide. And since it’s nuclear it’s a million times more compact than chemical fuels. One gram of LENR fuel corresponds roughly to a ton of gasoline. And unlike fission and fusion it doesn’t produce radiation, nor radioactive waste. It just couldn’t be better, it seems. But let me put it like this — if we can make LENR work, that is just the first step outside the light from the lamppost. It would be a solution to the energy problem for a long time. Still, given the amount of energy stored in matter there’s much more to discover, potentially letting us extract a large portion of the energy in every gram of matter in controlled forms. LENR just means finally opening the door to dispelling the streetlight paradox of energy. And the beauty is that it probably also could open a door to important new knowledge on matter, physics and the universe.